Shakespeare’s Will is the second play in Marin Shakespeare Company’s summer season. The 90-minute play explores the unusual marriage between William Shakespeare and Anne Hathaway. The couple remained married throughout their lives, even though Shakespeare appears to have left Stratford some time after 1585 and the birth of his children; his plays appearing in London in 1592. He returned to Stratford in 1596 to buy a home, New Place, for his family, but the following year he was again living in London. He retired to Stratford a few years before his death in 1616 at the age of 52. Anne Hathaway remained in Stratford her entire married life. 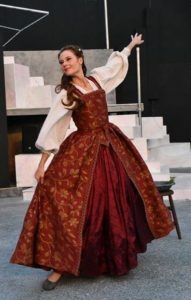 Elena Wright plays Shakespeare’s wife Anne Hathaway in Marin Shakespeare’s productions of “Shakespeare’s Will”. Photo by Jay Yamada. Shakespeare’s – and Anne’s – personal life remains enigmatic. Civil documents concerning their marriage in 1582 provide the few things known about their relationship. Anne was 26 years old and Shakespeare 18 when they married, and six months later, their first daughter, Susanna, was born. A further two years brought the twins, Hamnet and Judith. More puzzling is Shakespeare’s last will and testament. The bulk of his estate would go to his daughter Susanna. Anne, some argue, would automatically have inherited one-third of his considerable estate, or have been cared for by Susanna and her husband John Hall, the executors of the estate. Shakespeare’s lone mention of Anne, specifies that she would inherit “my second best bed”, along with the furniture. Scholars are divided over whether that bed was an insult or a pledge of love. Canadian playwright Verne Thiessen takes this “second best bed” as an insult. A reprimand and a revenge for Anne having allowed his son Hamnet to die at the age of 11, of causes unknown. Conflict, after all, makes for more gripping drama. In the long monologue that is Shakespeare’s Will, the playwright not only imagines an emotional life for the couple but also provides an explanation for the insult in several sequences in which Anne not only relives moments of her life but also enacts the roles of the various characters. Her Bill is as mysterious as the lack of information we have about him; amiable and restless, he contrives a deal with Anne in which they both live their lives separately and as necessity obliges them to. The death of Hamnet also remains mysterious; having taken the children to the sea to escape the plague, Anne sees him suddenly disappear while playing in the surf. Some of Shakespeare’s words spill over into the text. The play refers several times to Sonnet 145, which scholars speculate is addressed to Hathaway because of its punning reference to her name: “I hate” from hate away she threw,/ And sav’d my life, saying “not you”. In its entirety the sonnet is a clear token of his early love, revealing not only adoration but hesitation and self-conscious uncertainty. Elena Wright, Marin Shakespeare’s favorite female lead, admirably plays Anne Hathaway, making plausible the role of a woman abandoned to raise three children while her husband makes it big in the capital. And the second-best bed gets a stellar role as well in this production, with sets by Jackson Currier. Delia McDougall directed this pleasing hour and a half of theater. This season is the last before the company undergoes major changes. They will be adding a second indoor facility to their venues as well as upgrading the charming Forest Amphitheater on the Dominican College campus. The season’s first two productions, Hamlet and Shakespeare’s Will, continue through July 8. The third production, Pericles with Dameion Brown, starts on July 14 and ends August 5. For information and tickets, visit marinshakespeare.org.